Last edited by Chris Cook5; 06-16-2017 at 09:42 PM. When burning CDs from playlists is it better to use the lowest speed possible? If you want the burned CDs to last longer burning with lower speed is definitely advisable. Faster burning causes some CDs to degrade faster. What's the difference between audio cd & MP3? Audio CDs can contain a maximum amount of 16 to 20 songs but are compatible with CD players. MP3 CDs are only compatible on CD players if the player supports it, but can contain 650 MB to 700 MB data. That’s a lot more songs than on audio CDs. I don’t know if I understand it correctly. 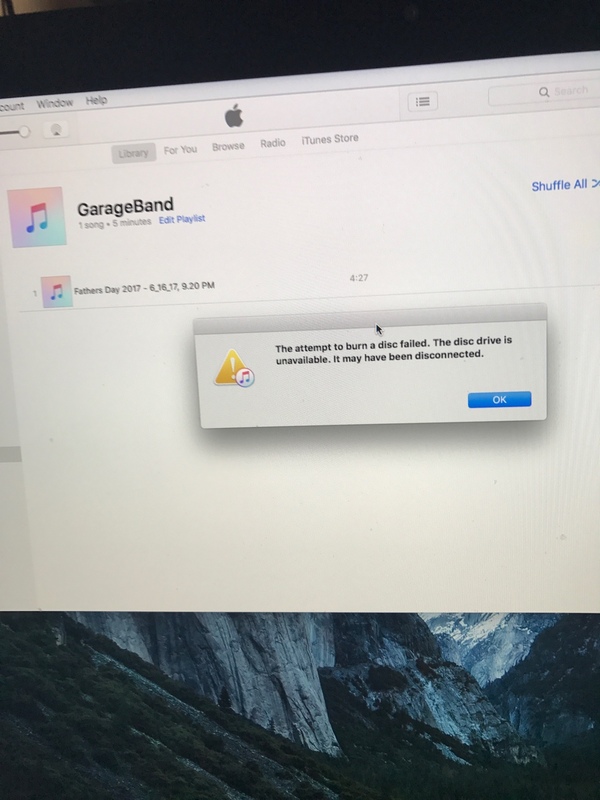 Did you already burn the garage brand file on a CD or do you want to burn it? If the latter, export the garage band as MP3 and burn it on a CD as data. Since it’s an MP3 file, go ahead and burn it as DATA CD. But, if you’re planning to play that CD on a very old, non-MP3 compatible CD player, then burn it as AUDIO CD. Yes. Data CD means the cd can contain all kinds of file types, whereas Audio CDs can only contain .wav files. That’s the default file type for Audio CDs. But most CD players will not play a "data" CD. If you want it to be able to be played in a "regular" CD player, you should make it an audio CD. Put any existing CD in it and try to access it. If possible, update the disc drive drivers. If there is a built-in diagnostics tool, run it. I don’t have a CD player/burner anymore in my desktop, so it’s been a while but these are the steps to be taken to fix issues. Oh, and make sure you put a blank, not-before-used CD in the drive to burn to. Any previous attempts on a CD make it impossible to use that same CD again. The top comment I agree with. If you do not intend for the cd to last long do a fast burn, yet if you have time to sit or let’s say you are in the middle of producing (media A/V) let it burn at a slow pace. Perhaps invest into a duplicator to aid you further. Also the file type Data well, it will not be able to be played on older CD players even some DVD players so depending on whom you are burning a CD for go with the original audio CD , higher production for higher “clients “ data depending on how many tracks and also how long the track itself is. Like a conference speaker or band being recorded through a multitrack software. Every Nintendo Switch game you can play right now and a look at what comes next!